Martina Hingis won the inaugural in 2001 prior to her semi-retirement due to a foot injury. I arrived in Doha in 2002 but tennis wasn't really my sport. In fact I don't play it. However, a renewed interest in photography in late 2004 also gave me interest to shoot anything worth photographing. And that included international sporting events such as this one. My first attendance of the Qatar Total Open was in 2005. That was when Maria Sharapova was still fresh from her success in Wimbledon and eventually, she won that years Qatar Total Open tournament. At the time, I only had a 3.2 Mp point & shoot compact camera with a 3x only zoom. It was slow and the lens was not long enough so I didn't had any decent picture from that event. I regretted the missed opportunity. Maria was so good, so exciting to watch in action and, of course, so beautiful. Also, at that time, the purchase of a DSLR was still in the drawing board and so I took note of that experience and made sure that a long telephoto lens will be included in my list of things to buy. In 2006, I was ready with my highly capable camera but Maria decided to pass on the opportunity to defend her title. The good news was that Martina Hingis has come out of retirement and decided to join the party. She became my instant favorite photo subject in that tournament. Too bad she was not yet in 100% excellent shape but still she made it to the semi-finals before she lost to Amelie Mauresmo. Nadia Petrova, however, defeated Mauresmo to win the 2006 title. This year, Martina is back, in better shape, and without Mauresmo nor Petrova - but there's Anastasia Myskina, a backt-to-back champion here and Justine-Henin Hardene to give her some competition. 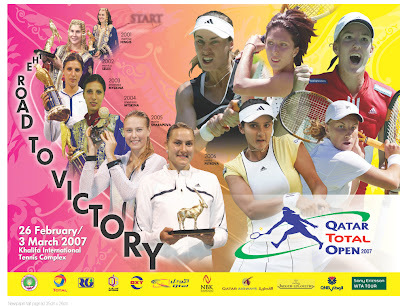 See some of the photos from the 2006 Qatar Total Open here.